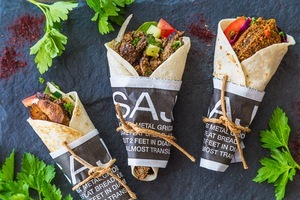 Sajj wraps. Photo courtesy of Sajj. Mediterranean bowls at Sajj. Photo courtesy of Sajj. Recipe testing: a meaty medianoche. Photo courtesy of Media Noche. While the city has been crying into its hands over the closure of ~MERIGAN SUB SHOP~, the SF real estate market keeps on chugging. Merigan’s Liza Shaw mentioned she had a taker for the location, and the new tenant is ~SAJJ STREET EATS~. I spoke with one of the partners (they are from Jordan, Palestine, and India! ), who explained it’s a Mediterranean fast-casual concept, and this will be its fourth location (other locations are in Menlo Park, San Jose, and Mountain View), with a couple of trucks that launched the whole concept three years ago as well. 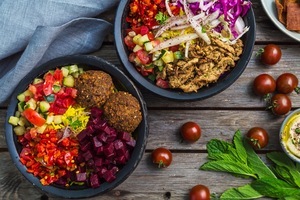 It’s based on a Chipotle model, where guests come in and can choose from a variety of proteins (chicken or steak shawarma, falafel, pomegranate chicken, kebab specials, and their hybrid: the popular shawafel, a combo of falafel with shawarma), and a format (a sajj wrap, pita, salad, or rice bowl), and then a variety of add-ons, from sumac onions to feta cheese, hummus, pickled cabbage, fresh mint, and spicy tahini. Check out the entire menu here. You can also order side dishes, like hummus and pita chips, and complimentary lentil soup is served with the main items. It’s all made in-house and ingredients are sourced fresh daily and locally—they care a great deal about consistency and freshness. The proteins are halal, and while the chicken isn’t organic, it’s antibiotic-free and never frozen. There are some house drinks as well, like mint lemonade. Since there is very little that needs to be done with the space, they plan to open within the first couple of weeks of November. Hours will be Mon-Fri 11am-3pm or so, with plans to see how things go before potentially expanding their hours into the evening. They said they are proud to be in the Merigan space and look forward to meeting the neighbors. 636 2nd St. at Brannan. 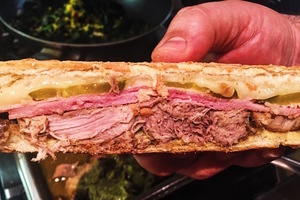 Back in September, I broke the news about a new fast-casual Cuban counter coming to SF, called ~MEDIA NOCHE~, specializing in medianoches, those marvelous sandwiches with layers of roast pork, ham, mustard, Swiss cheese, and dill pickles pressed inside sweet egg bread that is not unlike challah. The team (Madelyn Markoe and Jessie Barker)—who has been working with culinary consultant Telmo Faria—just revealed they will be going into the former Radish location. If all stays on schedule, they are slated to open in winter 2017. Follow along on Instagram and get excited. Read the previous post for more. 3465 19th St. at Lexington.